"Pistol" Peter Maravich (1947 - 1988) was an NBA basketball player. Pat Riley, now Head coach of the Miami Heat, said: "Pete was the original. He was the best ball handler I ever saw. Ever." Pete was the son of Helen and Press Maravich, born in Aliquippa, Pennsylvania, on June 22, 1947. Growing up, he had a strong urge to win. Depending on your point of view, he was a sore loser, or he had an unreasonable desire to excel. Just as unreasonable, was his father's expectations for him to perform. Consequently, Pete quickly became a competent basketball player. Because he was always pushing himself; and his father-the college couch-was always encouraging, guiding, criticizing him; by the time he was 13 years old he was practicing 8 hours a day, 5 days a week. Even more on Saturdays. And on Sundays, when the gym was closed, he would crawl in through a window and practice for a few hours. He hardly ever did homework: he would wake up early to practice before school. The school and gym were a couple miles from his house in Woodland Heights, so he learned to dribble on his bicycle. He brought his basketball with him everywhere, when he walked to school, the ball was part of him; dribbling became unconscious as he did it for 2 miles, twice a day, everyday. He made sure to use his right hand as much as his left. One time at a drug store, Pete was spinning a ball on his finger when a local kid bet him he couldn't spin it for one hour. Pete got $5 after he did it. He became a town sensation; everyone knew him for his ball skills. Pete Maravich went to school at Louisiana State University from fall 1967 to spring 1970. The years before, football was an obsession. Everyone seemed to know the Tiger's team history; fans of basketball were uncommon. Then the new coach, Press Maravich, came with his son. In only three years playing on the varsity team (and under his father's coaching) at LSU, Maravich scored 3,667 points—1,138 of those in 1968, 1,148 in 1969, and 1,381 in 1970—while averaging 43.8, 44.2, and 44.5 points per game. For his collegiate career, the 6'5" (1.96 m) guard averaged 44.2 points per game in 83 contests and led the NCAA in scoring for each of his three seasons. First, because of the NCAA rules that prohibited him from taking part in varsity competition during his first year as a student, Maravich was prevented from adding to his career record for a full quarter of his time at LSU. During this first year, Maravich scored 741 points in freshman competition. Second, Maravich played before the advent of the three-point line. This significant difference has raised speculation regarding just how much higher his records would be, given his long-range shooting ability and how such a component might have altered his play. Writing for ESPN.com, Bob Carter stated, "Though Maravich played before [...] the 3-point shot was established, he loved gunning from long range." It has been reported that former LSU coach Dale Brown charted every shot Maravich scored and concluded that, if his shots from three-point range had been counted as three points, Maravich's average would have totaled 57 points per game. 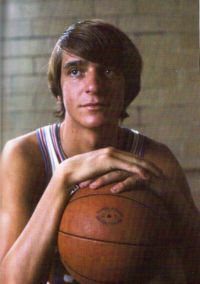 After leaving the NBA, Maravich isolated himself from his trophies and awards, his friends, and even playing basketball. His wife saw his moods swing between confusion, resignation and despair. He had a very strict diet, mostly vegan, and he would sometimes fast to "test himself". He bought hundreds of dollars worth of vitamins to extend his life, and invested money in numerous assets. Then one night he was thinking about the effect of alcohol on his family: it drove his mother to suicide, his brother Ronnie was now addicted to it, and one night he had been drunk, and he totaled his car into a parked vehicle going 55 miles an hour. Ever since his first taste of beer at age 14, on the steps of a Methodist church, it had had a negative effect on his life. When the police officer pulled Pete out of his wrecked car, he said "Pete, you're the luckiest man I've ever seen." A drunk Pete didn't have a scratch on him. "You don't understand," he replied dismissively, "I've got to play pro ball." He recalled a weekend a long time ago when he taught at a basketball clinic for the Campus Crusade for Christ. There he heard the Gospel of Jesus Christ but he said "I don't have time for you, Christ, my goals are set." For practically the whole night he was tortured by his memories of ugly things he'd done to people or himself. He remembered the word "sin", and saw all these painful deeds for what they were. In tears, he prayed, "God, I've punched you. I've kicked you. I've cursed you. I've used your name in vain. I've mocked you. I've embarrassed you. I've done all those things. Will you really forgive the things I've done?" Then he heard a voice. "Be strong lift up thine own heart." He woke his wife frantically, asking her if she had heard the Lord. She told him to go to sleep, thinking he was crazy. Pete, not a bit put off, went back to the foot of the bed, knelt and prayed, "Jesus, I know you're real because I've tried everything else, I've got nowhere to go. If you don't save me I won't last two more days." "From that moment on," Maravich later recalled, "my life was never to be the same again. When I took God into my heart, it was the first true happiness I ever had." For the first couple of days, his wife Jackie thought it was "just another phase", like the yoga, or UFOs, or Hinduism. "But it wasn't. It was for real." The Pistol changed the way basketball was played. Modern players are still inspired by him; he set a precedent and changed the whole style of the game. ↑ Rogers, Thomas. "Pete Maravich, a Hall of Famer Who Set Basketball Marks, Dies", The New York Times, January 6, 1988. Retrieved June 14, 2009. ↑ Medcalf, Myron (2014-08-18). What if 'Pistol' Pete had a 3-point line?. ESPN. Retrieved on 2015-09-16. ↑ Diaz, Angel (2012-03-02). The 25 Most Unbreakable Records in Sports History. Retrieved on 2015-09-16. This page was last modified on 7 May 2018, at 11:54.